The East Aldine District has as one of the goals in their Service Plan, the furthering of education and leadership for students and residents in their District. To this end, they have been contributing each year to scholarships for Aldine ISD students, through the Aldine Scholarship Foundation. At a reception last week, celebrating the 20th anniversary of the Foundation, representatives from the District presented ASF with a check for $30,000. This will allow two additional named scholarships to be set up in perpetuity, for use at Lone Star College. Making the presentation were David Hawes, EAMD Executive Director, and Clyde Bailey, chairman of the EAMD board. 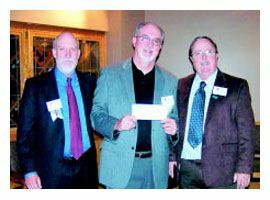 The amount of this scholarship award represents an increase over past years, from $15,000 to $30,000, according to ASF president Bill Townsend, who received the check. Speaking at the anniversary celebration were Townsend, emcee Reggie Gray of the North Houston Greenspoint Chamber, Stan St. Pierre on the History and the Mission of the ASF, and Dr. Stephen Head, president of Lone Star College-North Harris, on the opportunities that these scholarships provide to Aldine ISD students, and new programs and facilities planned for North Harris college in the future. Dr. Head in particular spoke of a Construction Trades Program that will be started by the college as a response to needs in the community, and the opportunities it will bring to the Aldine area. He also mentioned that LSC encourages high school seniors to have a “mind-set” of going on to college, especially by waving tuition fees for dual credit classes in high school, which gives them a big step into the community college program. St. Pierre said that since 1989, the Aldine Scholarship Foundation has awarded full tuition scholarships to more than 700 AISD graduates. The goal, he said, is to be able to provide first year tuition and fees to all AISD students that complete their high school graduation. Aaron Glenn, Aldine ISD, Aldine ISD Faculty Endowment, Aldine Optimist Club, Deanie Merritt, Donnie Dawhorn Memorial, Doris Davis, East Aldine Management District, Gallery Furniture, Glenn and Linda Huntley, Greater Inwood Partnership, Harvey and Yvonne Stotts, Houston-Aldine Lions Club, John E. Pickelman, Lone Star College-North Harris, MacArthur Senior High School, M. B. “Sonny” Donaldson, M.O. Campbell, Motiva, Nadine Kujawa, Niki Myers and Cher Brock Endowed Scholarship, North Houston Bank, North Houston Greenspoint Chamber of Commerce, Richard and Barbara Lee Memorial, Rigsdell Family, Ron and Mary Oruc, Stan and Suzanne St. Pierre, Steve Mead, Steven Parker, Supertravel, Supertravel Aldine Teachers, Texas Pioneer Foundation, W. W. Thorne. Some of these contributors have more that one scholarship in their name. Additional information about the ASF is available at www.aldinescholarshipfoundation.org, or by calling 832-813-6500. Last week, students at Keeble EC/PK received a hands-on lesson in ecology and recycling when the school celebrated Earth Day. 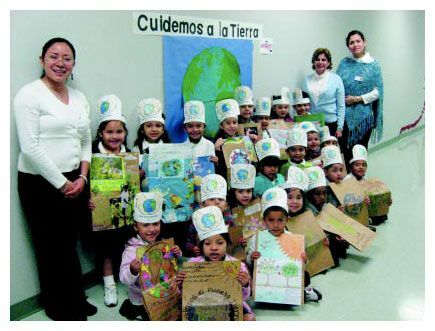 Telma Gonzalez’ classroom sent home a project for the family to do in celebration of Earth Day. This project incorporated many PK Objectives: they had to write the year on their hats in decimal system grouping numbers the 2 – thousand in green, the 0 – hundreds in red, the 0 – tens in blue, the 9 – ones in green, then the most wonderful part of this project was that the children were given grocery store paper bags to take home and decorate with their families. They had to decorate the bag exemplifying what Earth Day was all about. 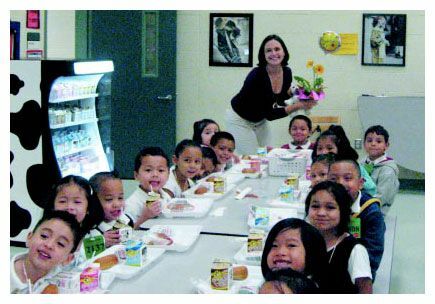 The bags were returned to school and on the date of Earth Day – April 22nd, these bags were returned to the grocery store so that the store will then give them to costumers with their groceries in them reminding them what EARTH DAY is all about. This project does not stop here. Gonzalez also asked the children to bring plastic, glass, and newspaper print to learn about the things that contaminate the Earth and the things that are OK for the Earth as well as to teach the children about Recycle, Re-Use, & Reduce so that the Earth will be around for many more years! The United States Army is the finest in the world. Throughout our country’s history, these brave men and women have demonstrated unparalleled patriotism, valor, and resolve. I join my fellow Texans in saluting the often unsung efforts of the American Soldier. The Army’s achievements would not be possible without the efforts of its Non-Commissioned Officers (NCO) Corps. These Soldiers — ranging in rank from Corporal to Command Sergeant Major and responsible for the “nuts and bolts” of daily training and operations in the Army at home and overseas — are truly the backbone of the Army. Oftentimes, commissioned officers are the public face of the Army, but NCOs work behind the scenes to get things done. Whether it’s the drill sergeant training new Soldiers, the squad leader caring for young Soldiers and their families, or the platoon sergeant leading a patrol in Iraq or Afghanistan, NCOs are out front, making things happen Army-wide every day. The U.S. Army is celebrating 2009 as the “Year of the Non-Commissioned Officer.” Since 1775, the NCO Corps has distinguished itself as the world’s most accomplished group of military professionals. Historical and current accounts of NCO actions are exemplified by acts of courage coupled with a dedication and willingness to do whatever it takes to complete the mission. NCOs have been celebrated for decorated service throughout our nation’s military history – ranging from Valley Forge to Gettysburg, to charges on Omaha Beach and battles along the Ho Chi Minh Trail, to the current operations in the mountains of Afghanistan and streets of Iraq. The recent actions of Texas’ own Staff Sergeant Matthew Kinney, from Nacogdoches, represent the tremendous level of leadership, dedication and courage epitomized by the Army’s NCOs. Demonstrating strong and decisive leadership in a very difficult situation, Kinney ordered all nonwounded Soldiers to secure the outside area as he triaged the casualties and stabilized the critically wounded. As hoist operations began, the aircraft and the shelter came under heavy machine gun fire. While completing a hoist, Kinney was able to locate the direction of the fire and redirect Apache gunships to take out the enemy threat, ultimately saving the crew in their MEDEVAC aircraft as well as the Soldiers still on the ground. As Kinney continued the evacuation, he repeatedly exposed himself to enemy fire as he diligently cared for his fellow Soldiers, without regard for his own physical well-being. Then, while en route to the Forward Surgical Team’s location, Kinney single-handedly treated the wounds of five critical patients. His heroic actions that day earned him a Silver Star, our nation’s third highest military award for valor. He has also been awarded a Distinguished Flying Cross for a separate engagement in Afghanistan. Staff Sergeant Kinney epitomizes the critical role played by our Army’s NCOs, and he and other NCOs like him provide the gold standard for others to follow. Today’s NCOs are more innovative and capable than ever; they lead by example, all while taking care of their fellow Soldiers, adapting to ever-changing environments, and taking on growing responsibilities. This year of recognition for our Army NCOs serves as an opportunity for Texans and all Americans to become better acquainted with the significant functions that NCOs carry out within our Army. They are truly a national treasure, deserving of our utmost gratitude and respect. Please join me in celebrating the accomplishments of Staff Sergeant Kinney and these fine American patriots. I applaud the efforts of the Army’s NCOs as they train and fight every day to preserve our way of life and care for the American Soldier. I also offer my sincere thanks to our Army NCO veterans who have sacrificed in defense of our freedom and who continue to represent the best of both Texas and the United States. I am humbled by your dedicated service. Well done! For the first time since we parted ways earlier this year, I realized Ive been doing pretty good without you. True, our years of history meaningful memories I will never replace. True, your sleek physique is still unmatchable. And true, I still havent quite figured out how to parallel park Diego, your replacement, as perfectly as I could with you. But you know what? Thats okay. Actually you were around for a lot of firsts. You were my first car. You were there during my first kiss and my first loveand you stayed for my first heartbreak. You cheered me on at my first lacrosse game, even though I wasnt very good. You were sitting quietly with me when I got my first ticket. You also were the one to take me to first experiences at many amazing restaurants, shops and scenic views. When I had to give you up, I was devastated. Where would all my firsts go? Who would I depend on now to take me places? Would I ever feel as comfortable again? Im sure you were worried about me too, since we knew each other for 12 years and were together for 8. So I want to assure you that Diego is great. It wasnt love at first sight, but hes patient and has many wonderful qualities. Plus hes got ultra low emissions. I actually took him Downtown for his first time this semester. Usually Im too timid to show him around, but it was time. And after 30 minutes of navigating him around inebriated pedestrians, constantly braking at the worlds shortest light, and making who knows how many sharp turns, nothing happened. Thats right, nothing bad happened. In fact, I found a spot where I didnt even have to parallel park him. Even in leaving, you taught me something about life. Its all about driving on and progressing. Its not just firsts that matter, but also seconds, and thirds, and fourths, as long as youre growing with every experience. Change is not only inevitable but also beneficial. Its also about never forgetting who helped get you where you are and gave you strength to keep going. Even if that who is just a car. Davy Baby, we had an amazing relationship, but I think Im ready to progress. North Houston was hit by heavy rains and thunderstorms on Saturday, canceling many events, flooding streets, and creating dangerous driving. 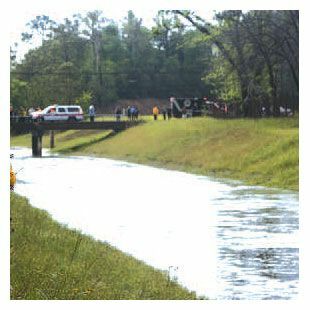 Authorities reported a family tragedy occurred on Greens Road near Aldine-Westfield as a combination of wet roads, possible driver intoxication, and a cell phone call that detracted him, combined to cause the car that Chanton Jenkins was driving to skid off the road and fall into a flooded drainage canal, which had as much as 9 feet of water depth. Jenkins was said to be the father of four of the children. The accident happened about 5 p.m., and rescuers found the car in the water about 7:30 p.m., downstream about 100 feet. Two adults and a 10 year old child were able to escape the sinking car, but 5 other children, aged 1 to 7 years, did not get out safely, authorities said. Houston police and fire departments initiated a search that included boats, infrared equipped helicopter, and divers, but as of Sunday one child was still missing, three were found dead inside the car, and one in the water. Texas Equusearch will help locate the missing child. HPD spokesperson Dese Smith said Sunday that the driver would probably be charged with intoxication manslaughter. A record 5 to 6 inches of rain fell in various parts of the county, according to the National Weather Bureau. NORTH FOREST – The North Forest Agriculture department and the FFA held their 47th Annual Livestock Show and Sale last Thursday evening, April 16. Students in the program exhibited 34 lots of animals, a few more than last year. In their welcoming remarks to the audience, students and bidders, North Forest Superintendent Adrain Johnson, and Board of Managers President George McShan, revealed their interest in Agricultural exhibits dated back to their days in high school, when each of them was involved in raising swine for their projects. Johnson said that he raised a Grand Champion Swine when he was at Frost High School, and McShan said he grew up on a farm near Harlingen, had an Ag degree from Prairie View A & M, and showed a Grand Champion Swine in high school. He also recalled his experience of being at the “New Farmers of America” convention in 1965, when that historical event occurred and it was dissolved in favor of admitting minorities into the FFA organization. 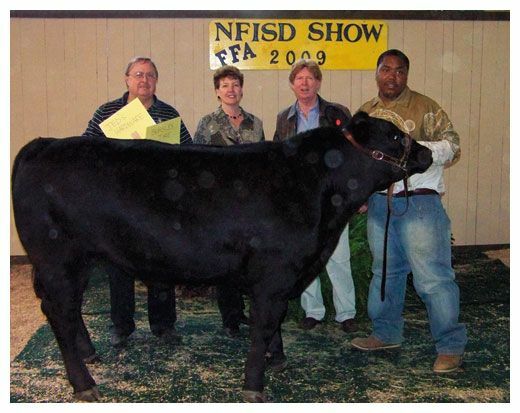 Not to be outdone by his bosses, North Forest High School principal Charles Russell reminisced about his days in East Texas’ Big Thicket area around Sour Lake, when he worked on a farm and gained his appreciation of raising animals as the FFA students do. During the bidding that followed, a total of $28,500 was bid for the exhibited animals, with “add-ons” after bidding bringing the total raised for the evening to $35,800. This money is used for scholarships and expenses for the students, according to AG advisor Bill Dodd. However, because of the economy and reduced enrollment numbers in the district, bidding and sale amounts were lower. The Grand Champion Steer sold for $5000, which compared with $5500 last year. The total money bid, $28,500 compared with $39,800 in 2008. 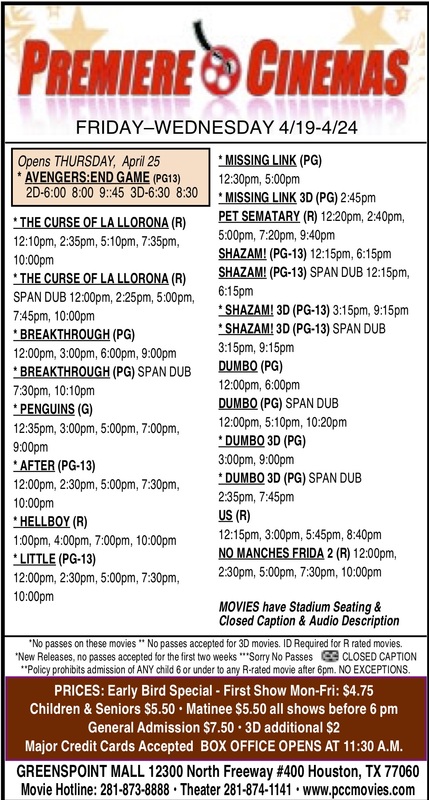 Considering that more animals were shown, this would mean that individual prices this year were lower. It was the culmination of a year of learning and raising their animals for the students, under the direction of AG advisor Bill Dodd. The FFA Event was held at the AG barn, on the campus of the original Smiley High School on Mesa Drive. Sales were brisk and spirited, as the auction proceeded under the direction of auctioneer Glenn Beckendorff. Exhibit Judges were Jeff McKnight, Steers and Swine; Shane Weldon, Poultry; and Suzanne Fulghum, Horticulture and Rabbits. This judging took place in the two days prior to the auction. Beckendorff, a personal friend and classmate of Dodd, mentioned that he had presided over the North Forest Auction for 25 out of the last 27 years, and always looked forward to it. Add-ons, a monetary contribution in addition to the auction bids, were made by Capital Bank $150 to each exhibitor, and North Houston Bank, Beasley Tire and Jed’s Hardware. Bidders this year included Northside Group (North Houston Bank, Jed’s Hardware, Beasley Tire, and Steve Mead/Component Sales & Service), Fred Guidry, Northeast Trailriders Association (Anthony Bruno), Melody Realty, Caldwell Companies, Zolman Construction, Bill & Margaret Ginder, Jed’s Hardware, Larry Prince, Constable Ken Jones, McCauley Lumber, North Houston Bank, Mrs. Hirncer in memory of Barbara Sack, AMS, A-1 Transmission (Kenneth Gibbs), Bill Dodd, Missi Joplin, John McNeil, Capital Bank, Elvin Franklin & Abner Brown, FFA Booster Club, and Allied-Kenco. Also on hand were former students, including John McNeil from the class of 1988, Fred Guidry, Anthony Bruno, Kenneth Gibbs, and Missi Joplin. HOUSTON — On Wednesday, as Texans across the state are filing their taxes, U.S. Senator Kay Bailey Hutchison (R-TX), Texas’ senior Senator, joined young Texas families and Houston area business leaders to discuss the growing burden being placed on taxpayers by excessive government spending. At a press conference held at the new Gallery Furniture store on Post Oak in Houston, Sen. Hutchison detailed her efforts to extend the sales tax deduction and to eliminate the marriage tax penalty in future legislation. “On Tax Day some in Congress may need a reminder of just who is underwriting the government’s spending spree: American taxpayers, like the Texans I met with today. They must not be burdened by a federal budget that borrows too much, spends too much, and taxes too much,” said Hutchison. 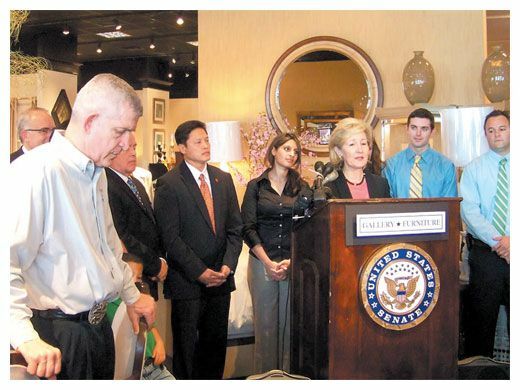 Also participating in the press conference, which took place at the Gallery Furniture Post Oak, were Texas families who will benefit from Hutchison’s tax amendments to the Fiscal Year (FY) 2010 budget that is now awaiting negotiations with the House. During Senate debate on the Fiscal Year 2010 budget, Sen. Hutchison introduced two amendments to provide tax relief to millions of Texas families by permanently extending the sales tax deduction and eliminating the marriage penalty in future legislation. Hutchison’s sales tax deduction amendment would prevent future tax increases on Texas families by allowing for the permanent deduction of state and local sales taxes. Texas is one of eight states that impose sales taxes in lieu of income taxes. Congress has extended the sales tax deduction every few years, but the provision will expire at the end of 2009. After a series of negotiations, the Senate accepted a modified version of Hutchison’s amendment. Additionally, Hutchison has worked to eliminate the marriage tax penalty. On the first day of the 111th Congress, she introduced the Permanent Marriage Penalty Relief Act of 2009 to outlaw this tax policy, once and for all. She also introduced a budget amendment to establish a point of order against any legislation, which would impose or increase a marriage penalty. The marriage penalty pushes married couples into a higher tax bracket than two unmarried single wage earners living together and taking in the same combined income. After years of fighting this unfair tax policy, Congress has made important strides toward eliminating the marriage penalty by lowering tax rates, doubling the standard deduction, and simplifying other elements of the tax code. The amendment was passed unanimously in the Senate. Hutchison and the families were joined by members of the Houston business community, including Jim “Mattress Mack” McIngvale; Don Paul Sweat, President of the Galleria Chamber of Commerce; Soofia Aleem, Executive Director of the South Asian Chamber of Commerce; Jeff Moseley, President & CEO of the Greater Houston Partnership; Jane Catherine Collins, Manager of Public Policy, Tax and Fiscal Issues, Greater Houston Partnership; Suzan Deison, Founder and President of the Greater Houston Women’s Chamber; Dana Kervin, Board Member of the Greater Houston Women’s Chamber; Elsie Huang, President of the Asian Chamber of Commerce; Danny Nguyen, President of the Vietnamese-American Chamber; and Laura Murillo, President of the Houston Hispanic Chamber.